The project is funded by the Federal Ministry of Education and Research (BMBF). Combine tangible, manipulatable objects (“tangibles”) with advanced technologies (“Augmented Reality”) to develop new, intuitive user interfaces. Through interactive experiments, it will be possible to actively support the learning process during the MINT study and to provide the learner with more theoretical information about physics. In the project interfaces of Smartphones, Smartwatches or Smartglasses are used. For example, a data gadget that allows you to view content through a combination of subtle head movements, eyebrows, and voice commands, and view them on a display attached above the eye. Through this casual information processing, the students are not distracted in the execution of the experiment and can access the objects and manipulate them. A research project developed as a preliminary study demonstrates the developments. 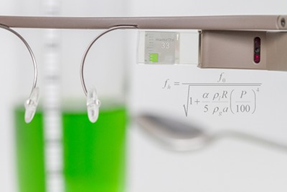 For this purpose, scientists at the DFKI and at the Technical University Kaiserslautern have developed an app that supports students and students in the determination of the relationship between the fill level of a glass and the height of the sound. The gPhysics application captures the amount of water, measures the sound frequency and transfers the results into a diagram. The app can be operated only by gestures of the head and without manual interaction. In gPhysics, the water quantity is recorded with a camera and the value determined is corrected by means of head gestures or voice commands, if required. The microphone of the Google Glass measures the sound frequency. Both information is displayed in a graph that is continuously updated on the display of Google Glass. In this way, the learners can follow the frequency curve in relation to the water level directly when filling the glass. Since the generation of the curve is comparatively fast, the learners have the opportunity to test different hypotheses directly during the interaction process by varying various parameters of the experiment. In the project, further experiments on the physical basis of mechanics and thermodynamics are constructed. In addition, the consortium develops technologies that enable learners to discuss video and sensor recordings as well as analyze their experiments in a cloud and to exchange ideas with fellow students or to compare results. The DFKI is a co-ordinator of five other partners in research and practice: the Technical University of Kaiserslautern, studio klv GmbH & Co. KG Berlin, University of Stuttgart, Con Partners GmbH from Bremen and Embedded Systems Academy GmbH from Barsinghausen.